Social democracy has been defined as ‘a way of life which recognizes liberty, equality and fraternity as the principles of life.’ This is called the trinity. To separate one from others will defeat the purpose of democracy. Without equality, liberty would produce the monopoly of a few over many. Equality without liberty would kill individual initiative. Liberty and equality without fraternity becomes unnatural. Social democracy puts individuals at the center, providing them opportunities to grow on the strength of their talents. Its premise is that all human beings, irrespective of their class, caste, color, gender, race, religion or sect, are born equal and deserve the same dignity and decency. Inclusion and equality are interwoven in social democracy based on the principles of pluralism and social justice. BP Koirala, the first elected prime minister of Nepal, said: “Democracy is indispensible for development. For development, we firmly believe that we need appropriate political institutions in which people have their vested interests. We believe that development moves only when people are involved in decision making process and their implementation”. Development is a political task. Development becomes inclusive, equitable, and sustainable only within an overall framework of democratic polity. BP said, “Foreign aid, in the absence of people’s institutions at the grassroots levels, creates a new class of people whose affluence is unrelated to the general economic condition of the nation as a whole. The new class is neither feudal nor capitalist. This new class has no economic roots in the country. It exists solely on the basis of manipulation of foreign aid, and through corruption and illegal trade.” As Nepal struggles to institutionalize historic democratic transformation—from absolute monarchy to democratic republic, from unitary system of governance to federal system to take the governance close to the people by building national democratic institutions—we confront such a situation. The world is becoming messier amid growing inequality and exclusion. If we look around, we see the world rising to new heights of extreme inequality: the richest 1 percent of global population possess more wealth than all the rest combined. The world is witnessing the resurgence of far-right nationalism, populism and xenophobia. Nations are turning inwards in this increasingly interconnected and interdependent globalised world. There is a preponderance of self- seeking tendencies, identity politics, communalism and regionalism. This is fueling fear, frustration, divisions and hostility in the society, which in turn trigger new fault lines. We firmly believe that liberalism, authoritarianism, right-wing populism, jingoism and protectionism hold the answers to today’s central issue: the exploding anger and apathy, increasing inequality and exclusion. 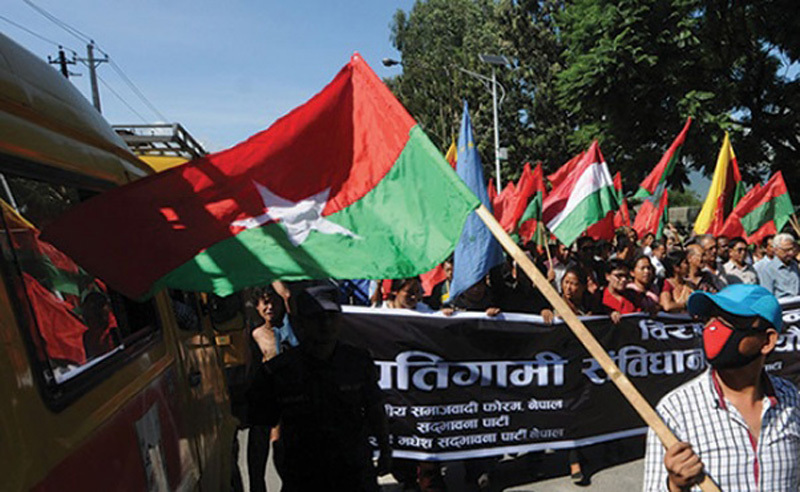 Nepal’s national strength is unity in vast diversity. We are a nation with enormous diversities of culture, religions, languages and ethnicities, castes and gender. While we are proud of unparallel resilience of our society which was visibly demonstrated in the immediate aftermath of the devastating earthquake of April 25th 2015, we must remain sensitive to vulnerabilities that arise from these diversities. We remain indifferent to these vulnerabilities at our own peril. By showing concern for most vulnerable citizens and unveiling meaningful pro-poor strategies, Nepal has the potential to indeed demonstrate a possible new direction to the world and other South Asian nations. Nepal, though a least developed country, has some of the most enabling economic, political and demographic conditions; and certainly the vast natural resources for it; the question remains as to whether we have the will and appropriate institutions to make these conditions work for the common benefit in a sensitive geo-strategic location. Nepal’s constitution has put in place several social, economic and cultural protection measures including for underprivileged and marginalized communities. Those measures demand increased public social investment with accountability and transparency in deployment of resources leading towards a progressive realization of political, economic, social and cultural rights of the population. Social democracy, as BP Koirala said, remains an inspirational ideal of life, and a model and a blueprint for development. The visionary leader, while addressing the Asia Pacific Socialist Organization Conference at Sydney on February 1981, said: “Socialism is the wave of the future. No society grows in an atmosphere of political repression, economic exploitation, deprivation and social exclusion and discrimination. Nepali Congress party firmly believes these challenges can only be addressed through a network of inclusive democratic institutions. Democracy is not a luxury for us. It is absolutely essential for us to develop and exist as an independent nation.